Category Archives: Q & A with the Industries Finest! Posted by SeriouslyNails in Q & A with the Industries Finest! Earlier, I decided to institute a monthly blog post to introduce to you people from the industry. A blog post in a simple, quick, informative format that hopefully introduces you to the folks who are the backbone of this industry. Up and comers, industry leaders, manufacturers, educators or artist that all share our love of Nails. This month I have the pleasure of introducing you to a young lady that I follow on social media. 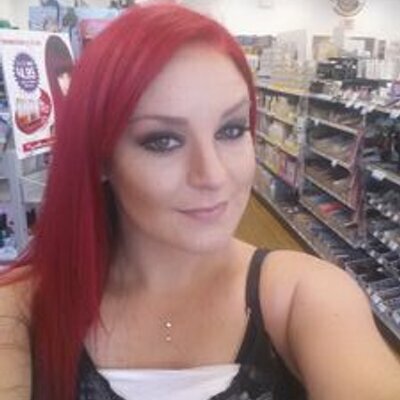 She is definitely a “Up and Comer” in the world of nails. she shows her true artistic self on many different social media platforms. As well as being featured in Nails Magazine and Nails Magazine Nail Art Gallery. I am please to introduce to you, Karalee Chabot. SN: How long have you been a nail tech? KC: I graduated from Nail School in February of 2013. 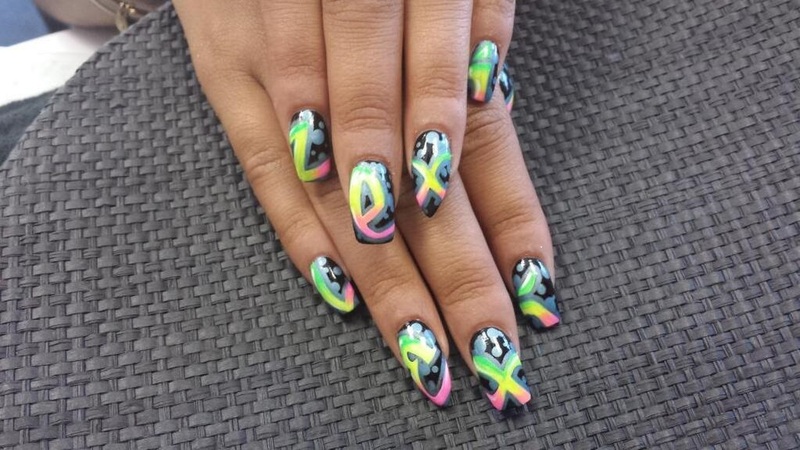 SN: You have been featured many times in NAILS Magazine and NAILS Magazine Nail Art Gallery. What was the date of your first ever edition of NAILS Magazine, and when did you first appear in it? 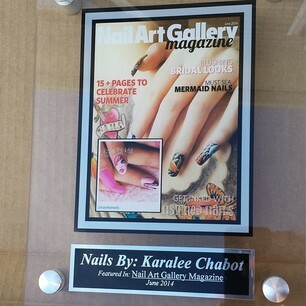 KC: I entered NAILS Magazine’s “Godzilla” nail art contest in late February 2014 and was informed by Hannah from NAILS Magazine on my birthday (03/03 of 2014) that my nails were being featured in the May 2014 issue. This was the first issue of NAILS Magazine I ever received. SN: When did you start to do the NAILS Magazine 30 day nail art challenges? KC: According to Instagram, my first entry was 43 weeks ago, so I believe that was around January/February 2014. SN: What is your favorite medium to work with? KC: Acrylic paint on Acrylic enhancements. SN: Tell us your best/favorite client memory. KC: I can’t say I have a specific memory. However, there’s nothing more rewarding to me then making clients tear up because they’re so pleased with their nails and nail art. SN: What has been the best piece of advice you have received with regards to the nail industry? KC: There are a lot of quotes for nail technicians that are posted all over social media. There’s a lot one can gain mentally and spiritually from most of these quotes. SN: What is the percentage of your customers that get nail art? KC: 98%! But I get that 2% to get nail art by giving them a little something “on the house” and believe it or not, most of the time they become frequent customers requesting nail art. hehe! SN: How do you manage to be so creative, run your business and take care of your darling daughter? Any secrets that you would like to share with other working nail technicians? KC: I have always been a creative person, I am an artist. I just took a while to find a way to utilize my talent and make a career out of it. I run my business as a hobby, I have a lot of passion for what I do. Nail art is extremely therapeutic for me. I have also come to figure out that by working based on appointments rather than working 9 to 5 suits me. This schedule I have created for myself has made is so much easier to balance time for my lovely daughter and still have some down time to work on projects for NAILS magazine. Advice for other passionate people out there, no matter what it is you do, don’t turn your hobby into work, you may end up hating it and give up. Be positive and think to yourself, “I’m not going to work, I’m going to do what I love most and what I do best”. This industry can tear you to pieces, but only if you let it! SN: If you could do one persons nails, either living or passed, who would it be? 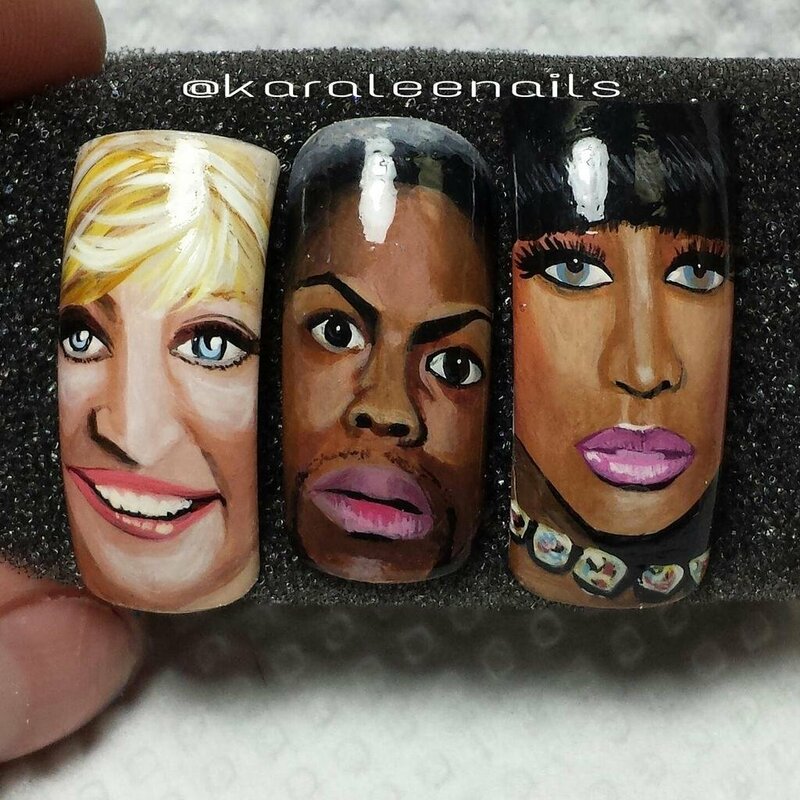 What would you do for them in Nail Art? KC: Nicki Minaj! She’s so creative and passionate about her music and fashion. She has that shock factor that I believe I have with my creativity in nail art and would be honored to complete her look with one of my wild off the top nail designs. Thank you Karalee for sharing your passion and insight about the nail industry. I look forward to many more of your designs on digits. Here is a special treat for you readers. 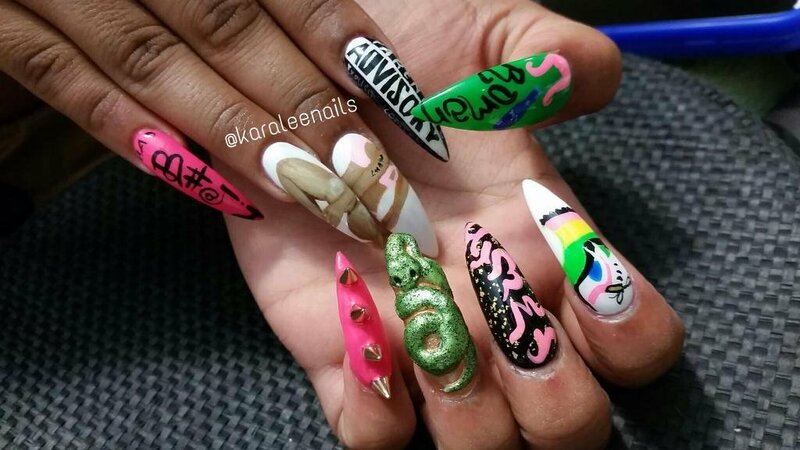 Besides her perfect portrait of Nicki Minaj, Karalee did a Nicki Minaj Anaconda inspired set of nails. I wouldn’t be surprised to see this in a magazine soon! I have decided to launch a new chapter in the Seriously Nails book. wouldn’t it be great if everyone got a chance to get to know the industry leaders, artists, manufactures and nail enthusiast out there. And so I asked a couple of people who fit into that category if they would be interested. Everyone said yes! I was going to talk with Naja and then the two of us decided that since I got the chance to talk with Lucien Henderson about THE NAIL PLATFORM, it might be better to start there. Beside THE NAIL PLATFORM, Lucien is the creator of Empower Nail Art. Empower Nail Art is a super thin self-adhesive nail film in varying designs to let your creativity bloom. A very interesting fellow with a great love for our industry. So here is my inaugural Q & A post from people in the Nail Industry! Enjoy! SN:When and how did you get started in the Nail Industry? LH: The founders of Minx, Inc. introduced me to the nail industry in 2009 and I served them until 2012. SN: You are the creator of Empower Nail Art! This is a unique product. Where did the idea come from? LH: I fell in love with the industry and the art, and am a little addicted to wearing it. 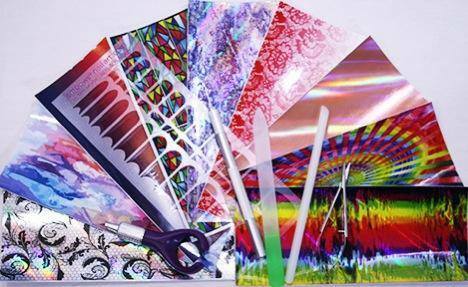 I knew vinyl films but could not find one that worked with all of the other nail mediums, they all had limits. It turned out that a new material needed to be made, and they only way to test the theory was to make it. Once we had a true nail film that worked well with acrylics, gels, polish and gel polish; it made sense to leave the use of it to the nail artist, so we leave it in un-cut prints and the artists cuts it as desired. SN: Has the idea for THE NAIL PLATFORM always been in your mind? How was the idea born? LH: The Nail Platform occurred to me during the 2012 show season. 2010 and 2011 I had run booths with no time to really walk the shows. In 2012 I attended for the first time, and went through the floors with different eyes, I was learning not selling. All I could find was product specific demonstrations — product focused, not skill focused. We have no structure for the independent educators and many of them are amazing. All the isles were packed with crowds watching platform hair artists. We have no answer for that, we don’t pump up the pros and inspire the students. The Nail Platform seeks to be a structure for ensemble leading artists to help raise the skills of others, while inspiring and elevating the art. Let’s get some action at the shows and let’s join up to share our skills! SN: How did you manage to meet up and join forces with the wonderful people you have taking part in THE NAIL PLATFORM? LH: A big part of falling in love with this industry was getting to know so many amazing people. I’ve met them selling, learning, sharing, helping at trade shows, networking events and social media. This community is full of great souls, and I’m blessed to have made wonderful friends. SN: As a nail artist, and besides Empower Nail Art, what is your favorite medium to work in. For both enhancements and nail art? LH: I recently completed school and will test soon. Thankfully, I’m getting tons of help from leading professionals! So I’m getting to know how to really use the mediums I’ve watched for years. I believe they all have their uses given the tech’s skill and the client’s needs. I like to stay in my safe zone of acrylic for structure then gels or gel polishes. Nail art for me is about layers, with each layer a part of the look I’m creating. SN: If you could have one client, either living or dead to take care of their nails, who would it be and what service would you give them? LH: Nice question! I’ll be doing my future wife’s pedis and nails every week…when I find her! SN: Ha ha that’s a great answer. Thank you Lucien for taking the time to let my followers get to know you and your dreams a little better. Best of luck with your inaugural THE NAIL PLATFORM.